Review: When mom wins a trip for a relaxing weekend away from the kids, a monster comes to stay, but it doesn't come without instructions. There is a book that tells the kids all about the care of the monster. Strange things begin to happen when more monsters show up, but not all is as it seems. I was really intrigued by the whole monster nanny concept. At one point I started to think, "is this monster really a grandma transformed, and its trying to tell the kids?" But no, it was not as I thought. Things started to get strange when the bathrobe began to talk. I'm all for strange, but around the last quarter of the book, I felt like the whole story flip flopped and turned into something else. It didn't feel like it stuck with the whole paranormal feel of the first three quarters of the story and it turned into something more scifi. The ending was pleasant, but not the reveal I hoped it would be. All in all, it wasn't bad. If I hadn't lost interest toward the end I would have rated it higher. 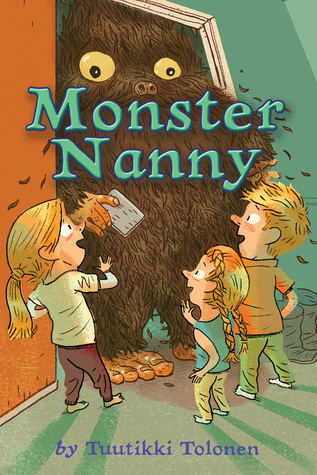 Three stars for Monster Nanny.